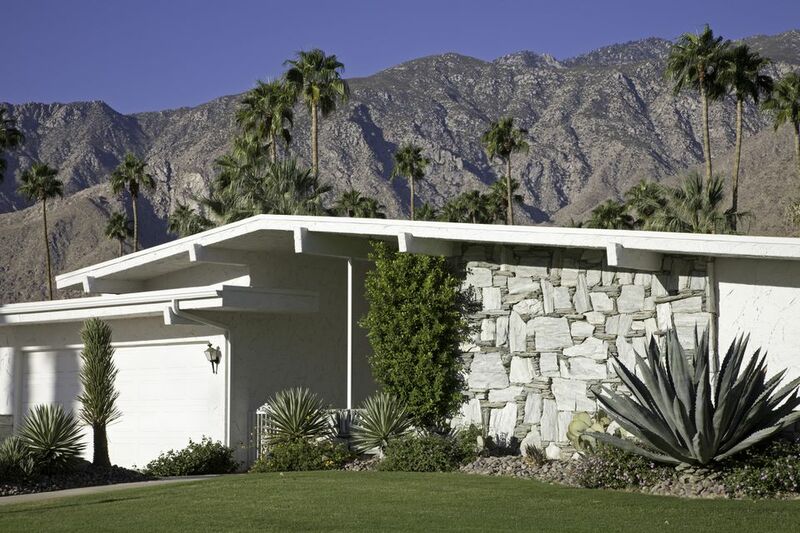 Postwar mid-century modern homes were designed to blend indoor and outdoor living. Homeowners could view their gardens through floor-to-ceiling windows and easily interact with the outdoor environments through sliding glass doors and patios level with interior floors. Landscaping for these homes was—and remains—clean and uncomplicated, with an emphasis on hardscape and the pleasures of outdoor living. 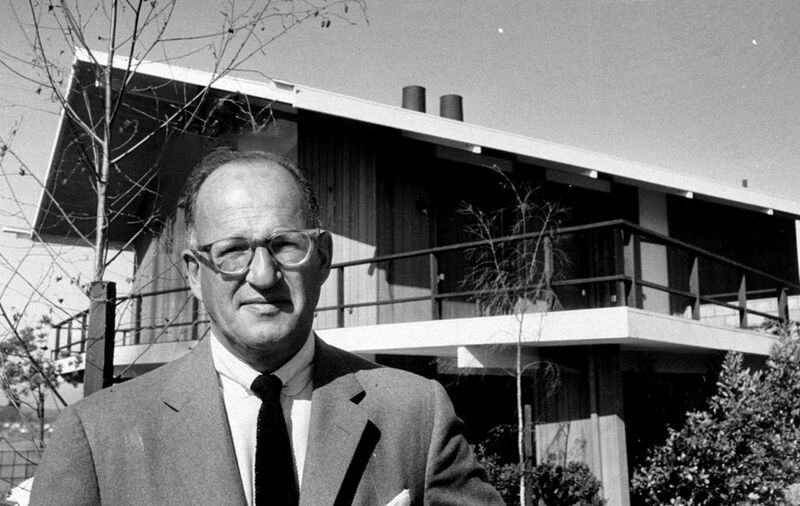 In the 1950s and 1960s, home builders like Joseph Eichler and Alexander Construction Company made Modernism accessible to the masses—building post-and-beam tract homes with exuberant, often exaggerated rooflines in Southern and Northern California. Mid-century modern homes also can be elsewhere, like Sarasota, Florida; Austin, Texas; Durham, North Carolina; and Australia. A renewed interest in the era and iconic architects like John Lautner, A. Quincy Jones, and Jones and Emmons has made mid-century modern homes hot properties. Many new homeowners restore these architectural gems, while others update them to meet contemporary needs and lifestyles. Rather than installing the standard lawn, many owners and landscape designers use outdoor spaces to echo the homes' architectural and interior aesthetic. Trees and shrubs are considered sculptural elements, while planting beds repeat geometric lines. Several mid-century homes have atriums—a central courtyard patio—which are true outdoor rooms. New homeowners resurrect atriums that were covered up or obscured in the 1970s or later. Not everyone has the same solution for a mid-century modern home, and these 24 beautiful and very different Modernist landscape designs prove it. Many mid-century modern homes in California were designed for the Mediterranean climate. Atriums were often built at the entrance or in the center of the home. Lee Ann Marienthal Gardens created this Orange County landscape Lee Ann Marienthal Gardens with an emphasis on mid-century and Asian design. An appealing escape, the atrium features boulders, a pond with waterfall, a flagstone patio and pond surround, and shade-tolerant plants like Japanese maples. Marienthal's team installed plants like star jasmine to hide the utilities, Coleonema pulchellum 'Sunset Gold', anemone 'Honorine Jobert', and Australian violet. Not all mid-century homes are large, luxurious and on expansive lots. Many were modest homes built in subdivisions, with limited square footage and on small lots. Northwest Native Landscapes used a combination of hardscape, sharp angles, and plants with textural details for a small postwar home in Portland, Oregon. Soft plants contrast with the home's angles and geometric shapes, keeping in mind seasonal interest. Colorful plants used include blue fescue grass (Festuca glauca) and conifers. The front yard and porch provide intimate spaces, achieved with horizontal wood-slat fences that repeat the lines of the house. The owners of an Eichler home in Northern California redesigned their landscape to incorporate sustainable features and add natives and drought-tolerant plants in cool shades to evoke a sense of calm, simplicity, and order. Designed by one of the owners of the design firm Building Lab and his landscape designer wife, the home features a sloping front yard that connects it with the surrounding hills. They also got back to the home's roots by adding an entry courtyard patio surrounded by horizontal wood fencing. Among its sustainable features are a Toro drip irrigation system, salvaged fencing, and a permeable gravel driveway. While its good bones remained, a 2,200-square-foot Eichler home in Northern California's Oakland Hills needed to be fully restored. Among other things, Beckner Contracting brought back the home's trademark carport and entry atrium. Growing in the wall-hugging planters are agapanthus (right) and delicate shoots of bamboo against the entry wall. A home in Laguna Niguel, California, designed by the late architect George Bissell received a revamp from Moss Yaw Design Studio, which includes geometric pavers, a low concrete wall, and planting beds with evenly spaced drought-tolerant plants. An Eichler home in San Jose features a large covered atrium created in an Asian style by MScape Design. The wood pergola provides year-round shelter, while decking is made of TimberTech in walnut. A two-story mid-century home in the Bridlemile section of Portland, Oregon, received an outdoor redo by Shannon Keaveny Landscape Design that reflects its origins. Graced by mature trees and shrubs, Keaveny added colorful ornamentals like cordyline, heather, and mini nepeta. Sarasota, Florida, is a hotbed for mid-century modern architecture. This Modernist-inspired urban industrial features hardscape; Floridian palm trees; and lush, coastal foliage designed by Borden Landscape. Stager for the home was iStage Homes. Many mid-century homes are private in the front: they lack front porches and you can't see what's going on inside. The backs of the house are often floor-to-ceiling glass, open to the yard. Boston-based Flavin Architects updated a home by architect Robert Coolidge—a contemporary of the famous Modernist Walter Gropius. Viewed from the back, the home features a two-level yard, each with a private walled patio that offers intimacy and outdoor living. A modern home in Portland, Oregon, built by Don Tankersley & Co. and designed by Situ Architecture, emphasizes natural materials and a linear design. Planting design, by Michael Schultz Landscape Design, is clean and Asian influenced with bonsais in wide, low pots. Accent illumination is by Oregon Outdoor Lighting. Another home with lots of windows in the back was designed by San Francisco architect David Henig. The deck screen is ipe finished with marine-grade teak oil. That hanging light fixture, which is stunning viewed indoors or from the backyard, is from the Moooi Raimond collection. Floating pavers in a sea of Mexican river rock lead to the entry of an Eichler home in Southern California. Created by Grounded, the design is modern, focusing on bold shapes, repetition, minimalism, and a deep connection between architecture and the landscape. Mid-century modern homes are everywhere, including Kansas City, Missouri. Clockwork designed a carpet of healthy green grass rimmed by a neat border of Mexican river rock that hugs the home's concrete pad. Webber + Studio, Architects breathed new life into a mid-century modern in Austin. Architect David Webber added cedar benches that match the home's exposed wood. The original concrete and aggregate driveway and path were reused as saw-cut pavers for a new walkway. You'll find numerous mid-century modern custom-designed homes and subdivisions in Southern California's San Fernando Valley. Jeremy Taylor Landscapes used Brazilian ipe for a Studio City pool deck. The bench is made of poured-in-placed concrete. Beneath the cantilevered patio cover is a rescued fireplace: an original near-mint 1960s Majestic rescued curbside at remodel. The colorful plant palette includes aeonium 'Blushing Beauty', yellow New Zealand flax, orange kangaroo paw, and blue chalk sticks senecio. A simple mid-century tract home was spruced up by Minnesota's Ground One with a decorative concrete block wall, reminiscent of the beautifully patterned designs from the 1950s and 1960s. Huetll Landscape Architecture updated the landscape of an Edward Killingsworth-designed house in Northern California. Mediterranean and native shrubs, perennials, and ornamental grasses work with the surrounding landscape, while hardscape reflects the home's modern lines. Planted on the terraced slope of a house near San Francisco are easy-care dianella "Little Rev' and nassella tenuissima. Designed by Envison Landscape Studio, beds or "boxes" are each planted with one type of dramatic plant en masse for visual impact. A generous setback allows for a meadow of ornamental grasses like Big Muhly and Mexican feather grass. Designed by Robert Leeper Landscapes of Austin, the grasses and other plants are deer resistant. Thousands of miles away, The Small Garden of Brisbane, Australia, designed a Palm Springs-inspired courtyard garden that features slat-horizontal and vertical fencing, a pergola, and architectural succulents like agave attenuata. Seed Studio likes to keep it clean and simple. Pea gravel paves the fire pit terrace. Drought-tolerant plants include low-growing dymonida and senecio, which are both grayish green. Exactly Designs livened up a mid-century house near Detroit with orange exterior trim, motel-style chairs, and vivid green grass. Low-growing shrubs in house-hugging beds don't block the view from the inside. Designer Elin Walters added fun architectural details like metal roofline rods, rectangular concrete planters, and modern address numbers. Extra-large fiberglass pots by International Art Properties are set on pea gravel against a horizontal wood-slat fence at a mid-century modern house in Mill Valley, California. Designed by Bradanini & Associates Landscape Architecture, the design features horsetail (Equisetum hyemale), which can be invasive if not contained. Pea gravel is a popular hardscape material for contemporary and mid-century modern updates. It's drought tolerant, permeable, inexpensive, and colors complement natural materials used on the homes' exteriors. Designed by Verdant Landscape Architecture of Santa Cruz, California, this backyard reflects the home's simplicity.